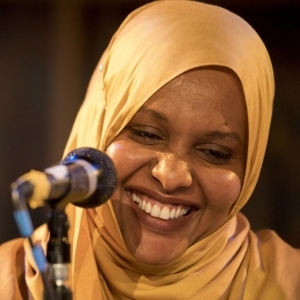 Although Asha Lul Mohamud Yusuf has lived in exile in the UK for 20 years, she is fast emerging as one of the most outstanding Somali poets, as well as a powerful woman poet in a literary tradition still largely dominated by men. She is a master of the major Somali poetic forms, including the prestigious gabay, by which she presents compelling arguments with astonishing feats of alliteration. The key to her international popularity is in her spirit and message: her poems are classical in construction but they are unmistakeably contemporary, and they engage passionately with the themes of war and displacement which have touched the lives of an entire generation of Somalis. The Sea Migrations was co-translated by Clare Pollard and Said Jama Hussein and Maxamed Xaxan Alto and published by Bloodaxe in 2017.